Happy February happy fellow foodies…. While Super Bowl is in the air, food is on the mind! and will warm the taste buds as well as the heart. It is truly a dish that requires time, but not a lot of effort. *Remove at least half of the oil and discard. *Pour the wine and port into the pan and “deglaze” the yummy bits. 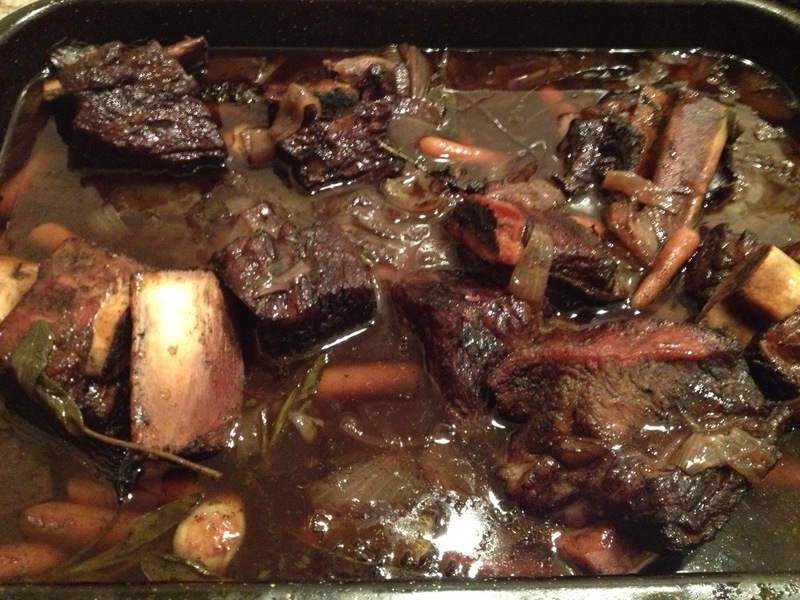 *Add into the wine mixture the garlic, thyme, sage…ribs and carrots and onions. If this pan is deep enough and oven safe (if not, transfer carefully to a proper size roasting pan), completely cover with foil and poke with a sharp knife to make a few small slits for steam to escape. When the ribs are done pull the pan out of the oven and let sit covered and in the braising liquids for approx 1/2 hour. Now pull the meat off the bones and throw out the bones. 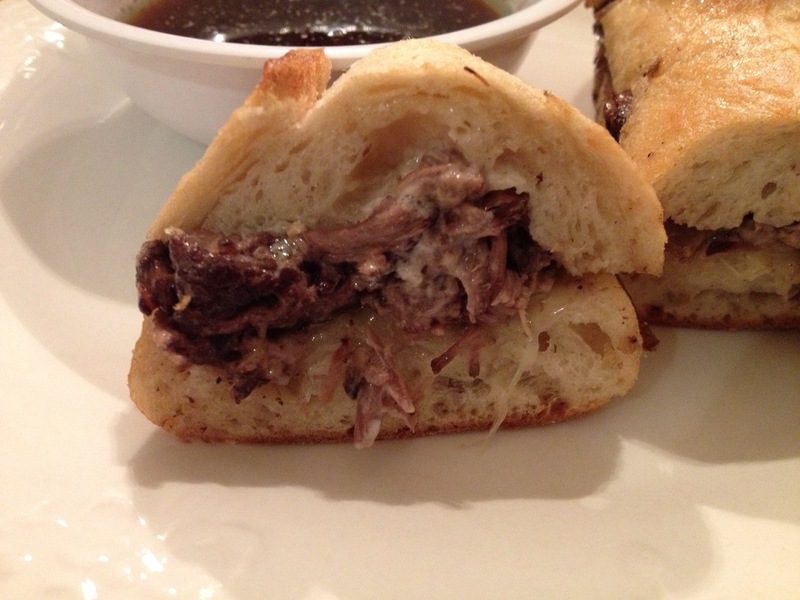 For your sandwich you can shred the rib meat as you will notice it will be fall off the bone tender. 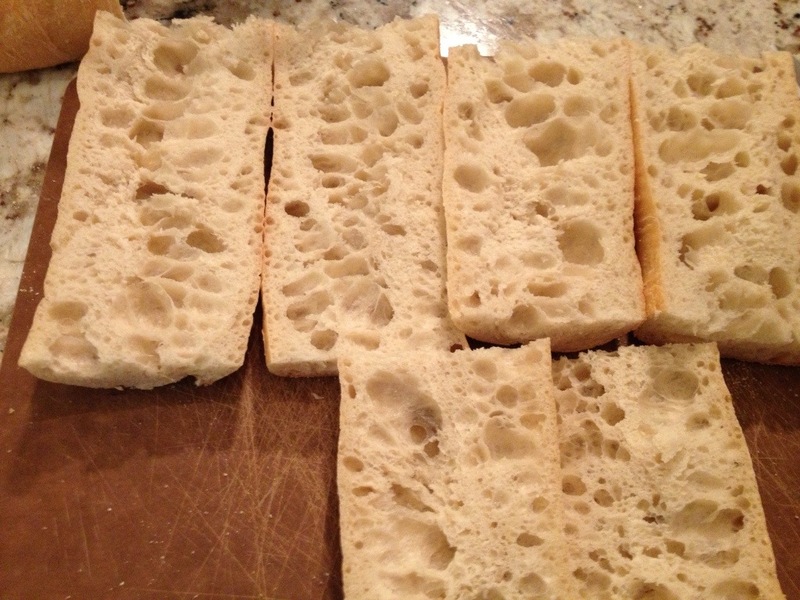 Now using you favourite bread (I use Ciabatta) cut the bread in half and add a slice of havarti cheese. Now mix the mayonnaise with a shake of garlic and a tablespoon of the braising juice and apply to the other side if the bread. 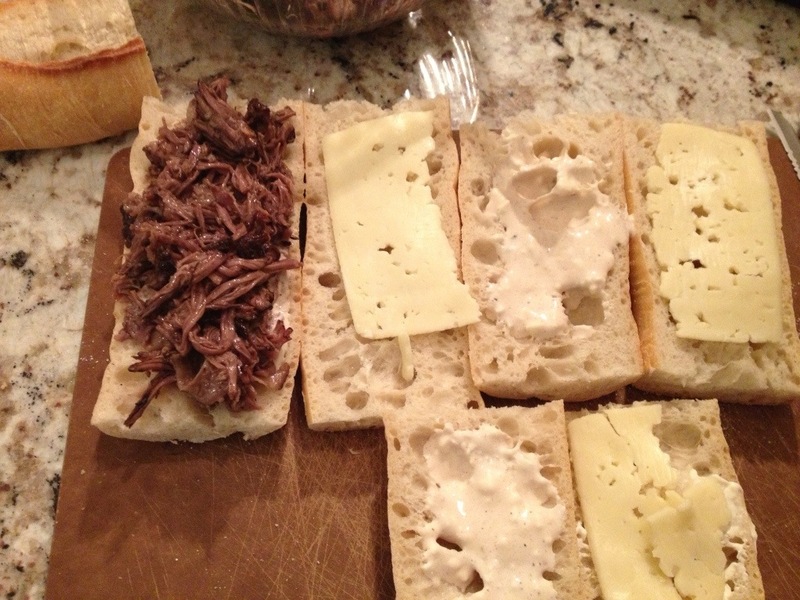 Place the shredded meat on either side of the bread and complete the sandwich. Wrap the completed sandwich in foil and put in the oven for approx 7-10 mins. 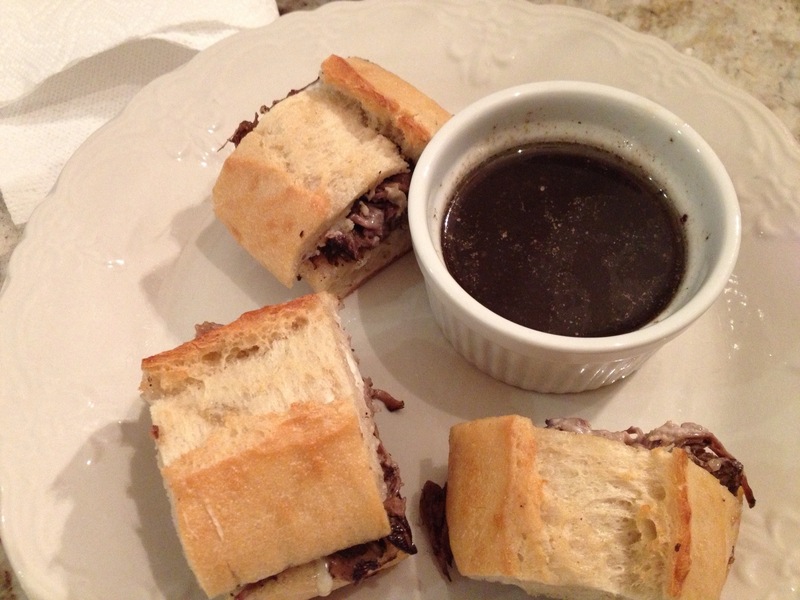 While the sandwich is warming and the cheese melting, strain the braising juice and place into a small “dipping” bowl. Remove the sandwich and arrange on the plate with the dipping bowl and enjoy! The heartwarming flavours will touch your taste buds magically with every bite. We have have this rib recipe many times now and enjoy it beyond belief! If you don’t want to have it in a “beef dip” serving, these ribs are an excellent dinner when served with root vegetables and either mashed potatoes or creamy polenta! The out if this world smells of flavour from the dish will fill your home and make your mouth water. 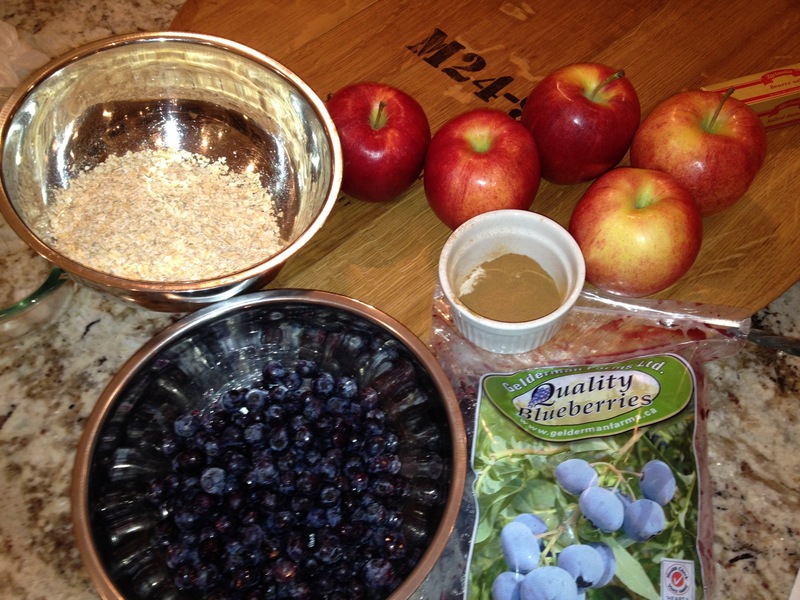 Do you ever have that craving for something sweet but want to stay with something a little healthier? 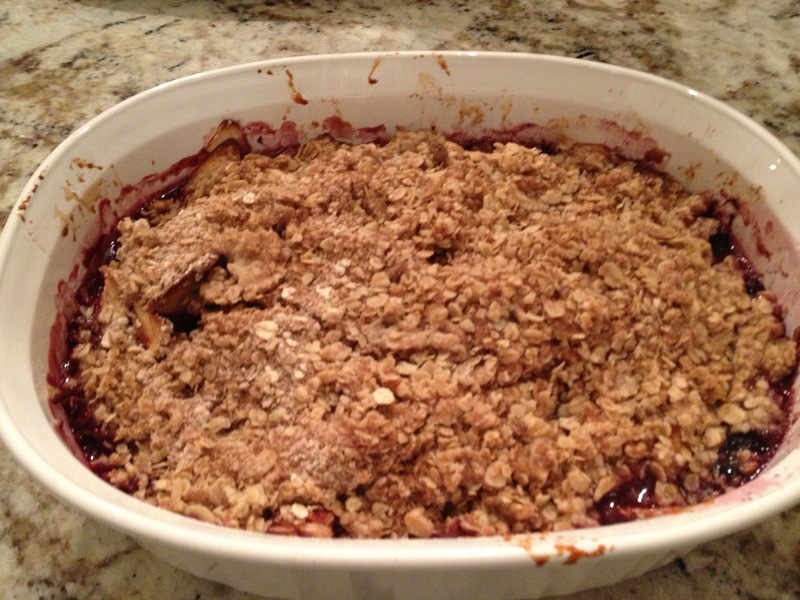 Apple Blueberry crisp came to my mind yesterday….. This sweet treat is simple, quick and a crowd pleaser in our home! 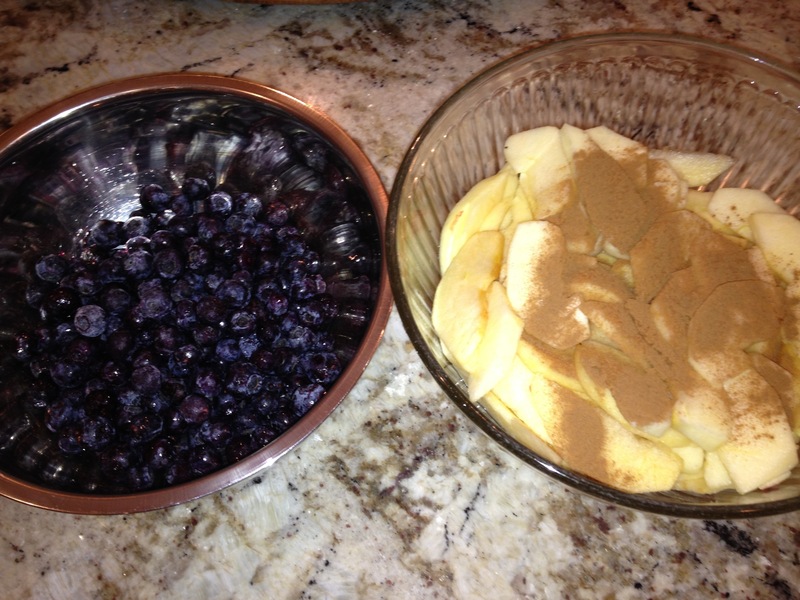 * Core and slice apples into thin slices (remove skin) and place in a large bowl. * Rind the lemon and add in the bowl as well as the juice from the lemon. In another mixing bowl put in the oats, brown sugar, butter, cinnamon and mix together with a fork binding all the ingredients together but leaving small chunks in consistency. Gently cover your apple mixture with the topping covering most of the apples. Let cool a few minutes but please do enjoy warm. 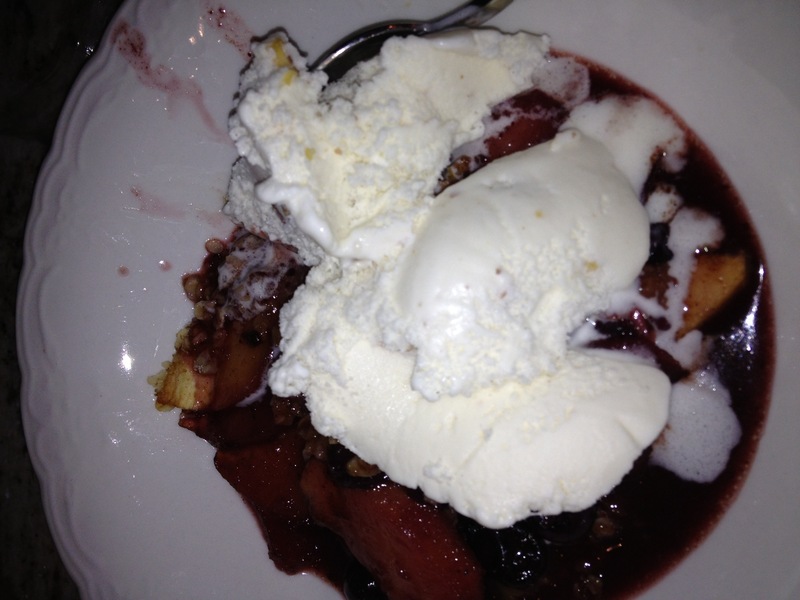 You can enjoy it as is or with a scoop of ice cream or fresh whip cream.